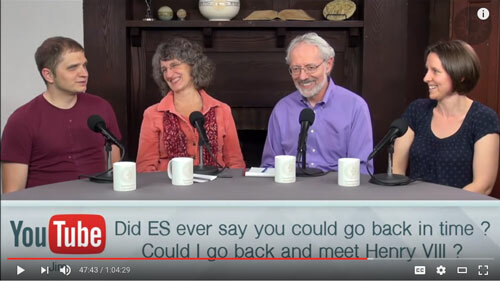 In this episode, host Curtis Childs from the Swedenborg Foundation and featured guests take questions from viewers and work together to provide insights into these matters with the help of eighteenth-century philosopher Emanuel Swedenborg’s spiritual writings. Questions and answers are summarized below, but follow the links for the full discussion. 1. 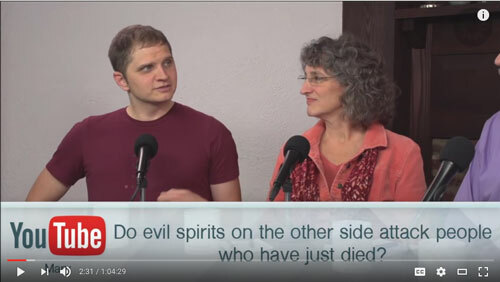 Do evil spirits on the other side attack people who have just died? In Swedenborg’s experience, angels take care of you right after you die, protecting you and surrounding you with love and support. On the other hand, some of those who experience near-death experiences do encounter negative spirits—but it always serves a teaching purpose. 2. I’ve learned a fair bit on Hinduism and the concept of karma makes sense, compared to my Christian upbringing of one shot at this life, heaven or hell is your reward. It just didn’t seem fair since everyone was starting from such different situations. Karma sort of answered it but I’m curious as to Swedenborg’s ideas about the many different places we all start from. Some have disabilities or come from “bad” homes. Some are blessed right from the get-go. In Jonathan’s view, our internal freedom counts for quite a bit—people who come from exactly the same circumstances can have radically different responses to their situations. Curtis points out that Swedenborg doesn’t describe a system where people are all held to the same black-and-white standard; it’s the sum total of people’s choices that determines where they end up, and even once we enter the afterlife we can still grow and change our circumstances. Chelsea agrees: even though life has its challenges, the other side holds true rewards that do account for the privileges or difficulties you’ve faced. The Lord can make the life—and afterlife—we need from any span of time and any circumstances. 3. 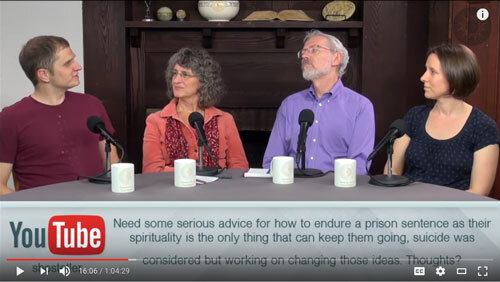 Need some serious advice for how to endure a prison sentence, as their spirituality is the only thing that can keep them going; suicide was considered but working on changing those ideas. Thoughts? It’s difficult to comprehend a situation like that if you haven’t been there. Many great people have endured prison to achieve wonderful things, so it’s important to hold on to hope and look for God’s intentions for testing times. There are spiritual practices you can do every day to challenge negative thoughts and feelings and identify them as lies. The Lord clings closer to you during times of trouble. 4. Did Emanuel Swedenborg teach or write about the Rapture? The idea of the Rapture as it’s envisioned today wasn’t really around in Swedenborg’s time, but from his commentary on the Last Judgment it’s pretty clear what he believed. He doesn’t think the world will ever end in a physical way, but instead he says that it will enter a new spiritual era. Based on Swedenborg’s system of spiritual correspondences, Jonathan speculates that the description of the Rapture actually refers to the earth and the spiritual world coming closer together. 5. 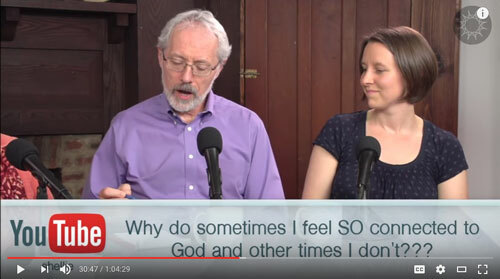 Why do sometimes I feel so connected to God and other times I don’t? In Chelsea’s words, “The Lord loves to play hide and seek.” It’s an experience everybody has, no matter how strong their faith. Even angels go through cycles of connectedness in the spiritual world. This fluctuation is an essential part of the connection. As Jonathan points out, if we’re always aware of God’s presence, then after a while we don’t notice it anymore. It’s the separation that makes us appreciate the closeness. 6. My mother died of cancer unexpectedly. I just need to know that she’s happy and not in pain. The panel unanimously agrees that she is definitely happy and definitely not in pain. From Swedenborg’s point of view, death is much more difficult for those that remain in the physical world. Know that they are okay and then get the help and support that you need. 7. Did Swedenborg ever say you could go back in time? Could I go back and meet Henry VIII? Swedenborg spoke to people from the past but not through time travel. He encountered them in the afterlife and learned about their physical lives, but he couldn’t go back in time as we know it. People who have the same affinities in the afterlife will be drawn together, so while in theory any two spirits could meet, in practice sometimes they’re just in different spiritual places. 8. When I think about my brother who passed, am I bringing his spirit close to me? Yes, but it’s just as possible you’re thinking about him because he’s already close to you. In the spiritual world, thought and distance are almost the same thing. 9. Did Swedenborg speak about a new civilization? He does, and the panel believes it’ll be pretty great. Swedenborg doesn’t get into specifics of how the government or economy works in the future, but it appears to be a utopia governed by love and wisdom. Hopefully our attempts to live in love will help us get there. 10. So when we are thinking of someone in heaven, how can they be with us if someone else is thinking of them too and it’s thoughts that make you travel in heaven? How can they be in two places at once? In Jonathan’s words, “It is stranger than that.” Even Swedenborg admits it’s hard to comprehend, but his understanding is that each of our thoughts and feelings is able to act independently in the spiritual world. Think about multi-tasking, like you’re driving and listening to music at the same time, or talking to one person and thinking about another.